Here’s an endeavor that I’m throwing my full support behind: organic and sustainable farming at Costales Nature Farms! The Philippines with its more than 7,000 islands is best known for its gorgeous beaches. How many people go there to visit a farm? Not many, I suppose. 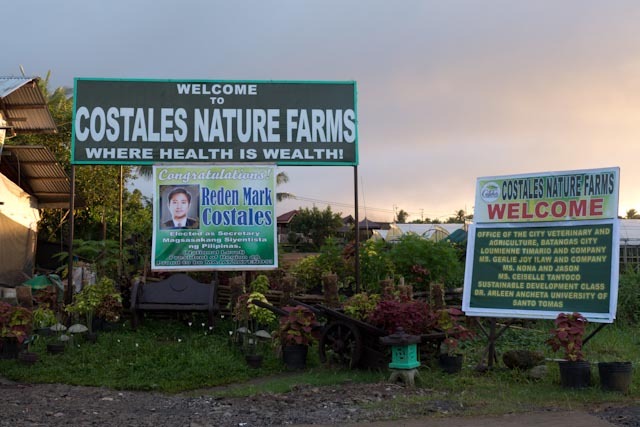 But I read about Costales Nature Farms and it piqued my curiosity. Sustainable and organic. No pesticides and chemicals. Zero waste. How do they do it? I decided to find out. The drive from Quezon City to Majayjay, Laguna took three hours straight via C-5 and the South Luzon Expressway (SLEX). The drive back to Quezon City took four hours. Whew! Costales Nature Farms offer different tour packages (you can find it here). I managed to do the 3PM Lakbay Aral Tour (PhP260 = US$5.20). It included vegetable snacks and a guided farm tour, plus free WiFi access (which I didn’t get to use during my visit). Before the tour began, what turned out to be “vegetable snacks” were a vegetable salad and a refreshing glass of fresh cucumber juice! 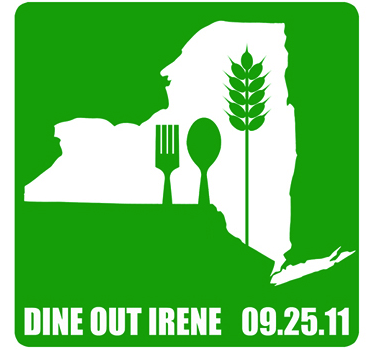 The salad had lettuce, radish, carrots, cucumber and alfalfa sprouts – all grown on the farm. Here are the photographs I took during the farm tour. Area where Romaine lettuce and Tuscan kale are grown. The secret behind Costales Nature Farms is best summarized in four words: Effective Microorganism Activated Solution. You’ll find out more about it when you visit. 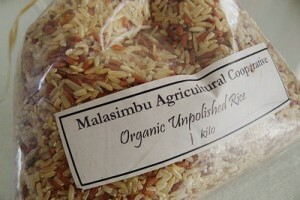 If you want to experience farm life, they offer cottages that accommodate two to twelve persons. Tip: If you’re going there, wear boots. The farm has muddy areas, of course, so traipsing around in sandals is a no-no. I was very impressed with their organic animal farm. If you’ve ever been to a regular animal farm, then you know that most of the time, the smell isn’t really quite up to snuff (or sniff). But the piggery at Costales does not smell bad. The pigs also look lean and healthy, and they have ample room to roam. Even the chickens were walking about; one went rogue, roaming outside of its cage, but the tour guide told me that it goes back to the right cage anyway, so I shouldn’t worry. An interesting discovery for me was magic fruit (or miracle fruit) given to me by my tour guide. She peeled a calamansi for me, told me to eat the magic fruit and then eat the calamansi. The magic fruit made the calamansi taste sweet! Amazing. After visiting this place, I decided that a longer visit next time is definitely in order, especially since I didn’t get to eat at Apong Damian’s Organic Resto. Have you been to Costales Nature Farms? The last time I checked, red velvet cupcakes are still the reigning kings of cupcakes in terms of popularity. While I do love me some red velvet anything, I’m a bigger fan of carrot cupcakes. I still marvel at how good carrot cupcakes (and cakes!) taste, to think I found the concept very strange when I was a kid. I’m getting a friend to bake me some very soon, and I figured it would be interesting to find places that make organic carrot cupcakes. Here’s a quick list of organic bakeries I found. Lovely Confections. This Denver, CO-based bakery makes sure to use locally sourced and organic products, and offers carrot cupcakes with cream cheese frosting. Grant Farms in Wellington, CO supplies the bakery with some of its ingredients. I Love Cupcakes. This bakery is in Largo, FL, and they promise to “bake you happy”. The carrot cupcake they have is called the Peanut Butter Banana, which features “a moist, organic carrot cupcake topped with a creamy peanut butter frosting & an organic banana chip”. I have never had a carrot cupcake with peanut butter frosting before, so I’m quite interested in this one! The Organic Cupcake. This Florida-based bakery is the brainchild of a husband-and-wife team who wanted to make sure that their kids are able to eat something yummy and healthy at the same time. They don’t use premixes in their products, and they make sure to operate in an eco-friendly manner too. They actually offer two carrot cupcakes: Orange, Carrot & Golden Raisins, which also boasts a touch of orange, particularly in its cream cheese frosting, and Carrot & Coconut, which features a bit of nutmeg and a vanilla coconut cream cheese frosting. Big Man Bakes. As you can guess from the name, a big man (named William “Chip” Brown, to be specific) is behind this Los Angeles, CA bakery. Big Man Bakes offers mini and XL cupcakes, and the carrot cupcakes are made with organic carrots. Pattycake Vegan Bakery. They recycle, they reuse, they deliver their products by bike, their treats don’t contain any animal products–whew! Pattycake in Columbus, OH seems to be doing everything right. 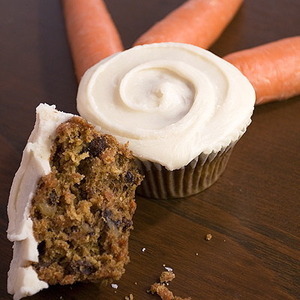 Their carrot cupcake (shown in the picture above) looks really good too, and is packed with healthy stuff like contains organic carrots, raisins, tofu, and dry cane juice, among others, and its “cream cheese” frosting is free from animal products. I know this post is supposed to be about organic carrot cupcakes, but I couldn’t resist including a carrot cake that intrigued me. Respect Organics in Dorset, England offers a carrot cake that is certified organic and is good for vegetarians, too. New bakeries always have people buzzing, so this new one that’s opening in Norcross, Georgia on Saturday will be sure to have a lot of fans. Terra Dog Bakery offers something much more interesting than cupcakes. Owned by brothers Tim and Andrew Suggs, Terra Dog Bakery offers organic treats, such as jerky, cookies, biscuits, and even cakes, for various dog breeds. They know that different dog breeds have different nutritional requirements, so they made sure to cater to as many breeds as possible. 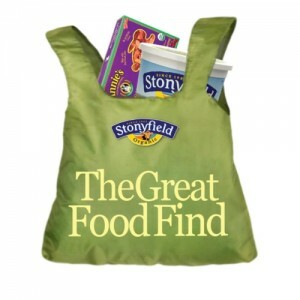 The available treats are free of gluten, wheat, soy, corn, and preservatives. The bakery’s grand opening will feature dog contests, pet photography sessions, and goodies for the first 25 dogs. The event will take place from noon to 4 p.m.
Terra Dog Bakery is located at 51 S. Peachtree Street Norcross, GA 30071. Check out their Facebook page for updates and more pictures of their yummy goodies.